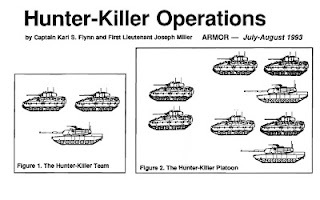 M3/M1 hunter-killer teams have been widely used by US Cavalry formations during both Iraq wars. I generated this scenario in Armored Brigade to test their effectiveness in the times of the AirLand Battle doctrine. 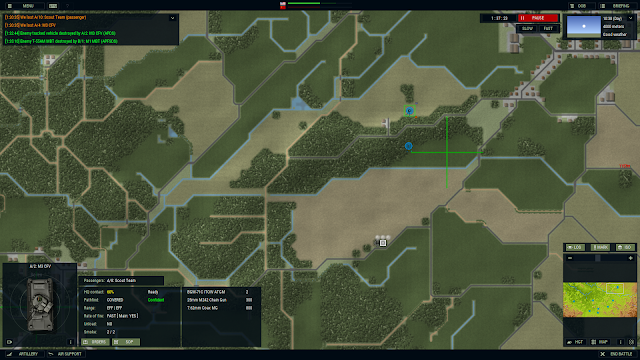 In this scenario, I have a platoon of M1 tanks and a platoon of M3 Bradley CFVs. We have been ordered to advance against light opposition (one platoon of T55s and a platoon of BMP-1s) and reconnoiter a few areas of interest. The width of the sector (~7 km) obliges for a spreading of own troops not unheard of for area reconnaissance but very uncomfortable when a fight is expected. 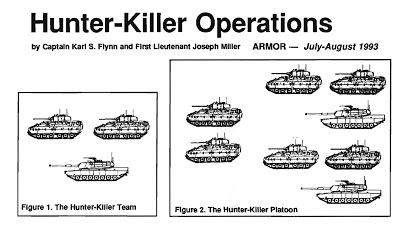 The use of hunter-killer teams is discussed in the July-August 1993 issue of the Armor magazine. In a nutshell, the M3 CFVs are the hunters who search for targets and the M1 are the killers which are called upon by the CFVs to shovel aside the enemy. The nuances of the hunter-killer inner workings are many, like the lateral separation of hunters, the distance between hunters and killers, the coordination between many hunter-killer teams, and more. One thing is constant though, moving without immediate support from other units requires a trooper and his keen for stealth, his insatiable thirst for information and his hunger for the weak spot of the enemy. 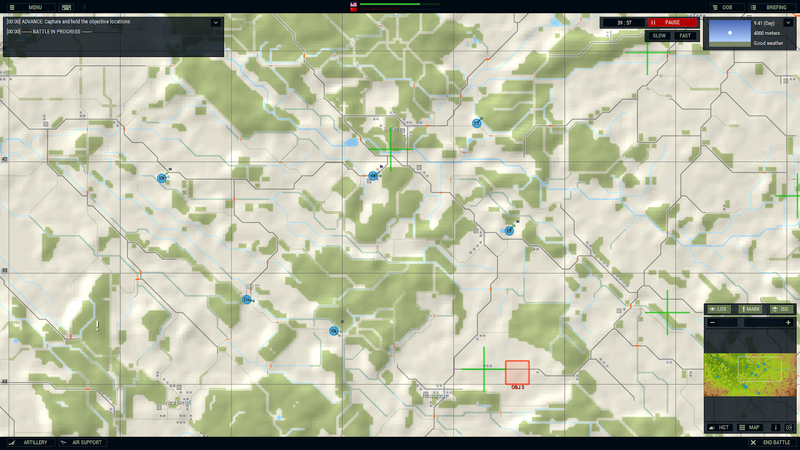 Armored Brigade's scope is ideal for these operations, the only caveat being the lack of proper reaction drills in the virtual troops. The CFV in the screenshot has received fire and it dropped smoke immediately (good), but failed to move out of the killing zone (bad) and had to be ordered to move towards cover, at the cost of orders delay (bad). I know it is difficult to embed universally valid reaction drills into the AI of units, but at least the game timer needs to be automatically paused at certainly critical events (enemy spotted, unit under fire) like in CMANO. Showcase 1 is in the screenshot above. A CFV (northmost blue icon) detected a tracked unit south, across the open field. An M1 tank was summoned to cope with the threat while the CFV pulled back. Final result: two ENY armored units destroyed, one by each the hunter and the killer. Showcase 2 is in the screenshot above. A CFV (southeast of OBJ2) has dismounted its troopers (northwest of OBJ2), who in turn found a T-55 ENY tank. 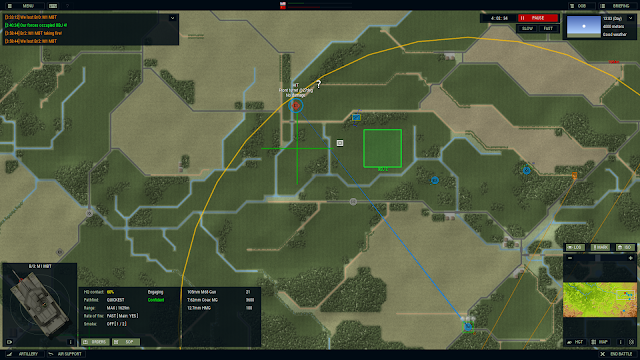 An M1 was called upon at first, but the lack of tactical finesse in its movement to contact got him destroyed. A second M1 tank (blue icon, southmost friendly unit), taking advantage of a greater separation, succeeded in engaging and destroying the threat. 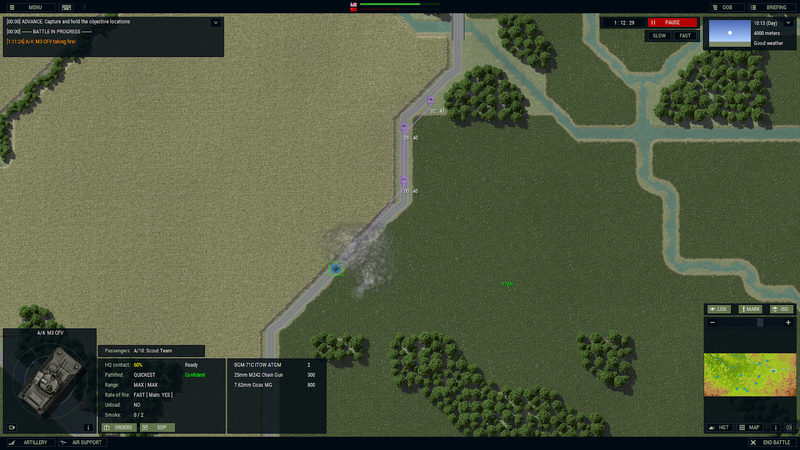 Happy to see you did something up on Armored Brigade. I'm pretty impressed with it. The comms log, if you can train yourself to keep an eye on it, will report TIC calls and you can quick pause from there. It's what I have to do unless attacking; troops are pretty good at pushing through it seems, but sometimes not the greatest just getting bumped. Thanks for reading this so attentively. Absolutely correct and thoroughly illustrated in the Armor article. I let my men down more than once in this scenario. I was also thinking about auto pause, but there will be too much auto-pause when we play high point games, like 20k point game. Currently game highlight events with animation of concentric circles, I think they should increase the circle size and show circle from minimap as well. That might help a bit.